What am I most excited about as I prepare for the PASS Summit here in Seattle this week? A lot of things. Preparing for my session, which will be on Thursday at 1:30, by far the most popular and interesting topics are about integration and tool choice. Today’s public announcement on the SSRS product team blog about on-premises Power BI integration with Reporting Services is really big news. It’s great to see two of the technologies I love working together. 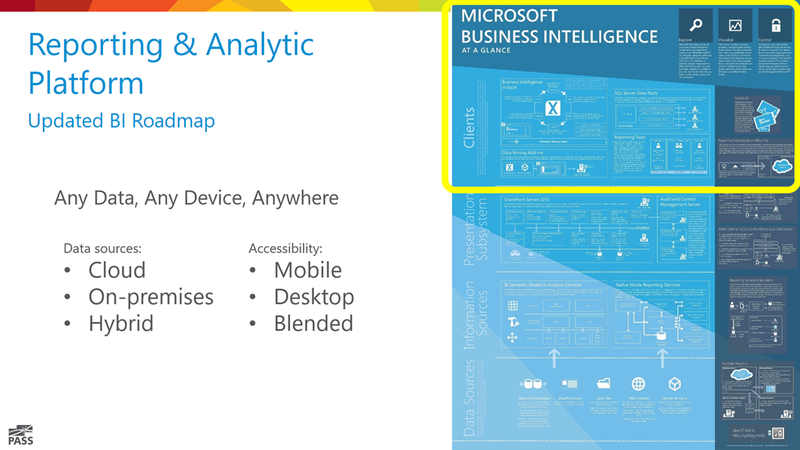 Whether in the cloud or on-premises, Power BI and Reporting Services can be used together. Thursday’s session is titled “Reporting Services 2016, the Force Awakens”. The consensus among industry users is that Reporting Services was stalled and left alone for far too long. Technology and industry trends have moved forward over the past five years or so but Microsoft have invested in other tools and products, aside from Reporting Services. 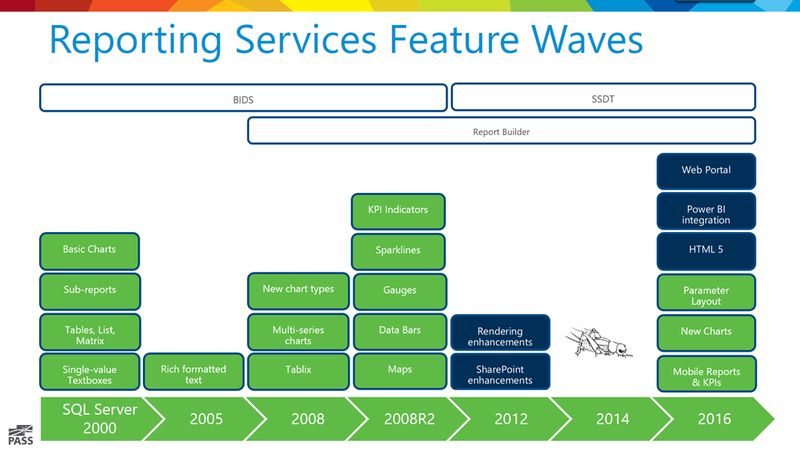 The SSRS server architecture is capable but the rendering and delivery components needed to be modernized. The good news is that the modernization effort has been underway for quite some time. Resources that were directed to other investments have been recommitted, not only to the Reporting Services product, but to integration across the product stack. It’s really hard to build a reporting platform that addresses every need. I think Microsoft have a history of creating false expectations by putting experimental and incomplete features out in the industry that weren’t on the committed roadmap. I know better than to believe that the pattern won’t ever be repeated but I firmly believe that there is a well-defined reporting and BI roadmap and product teams are making rapid progress against it. 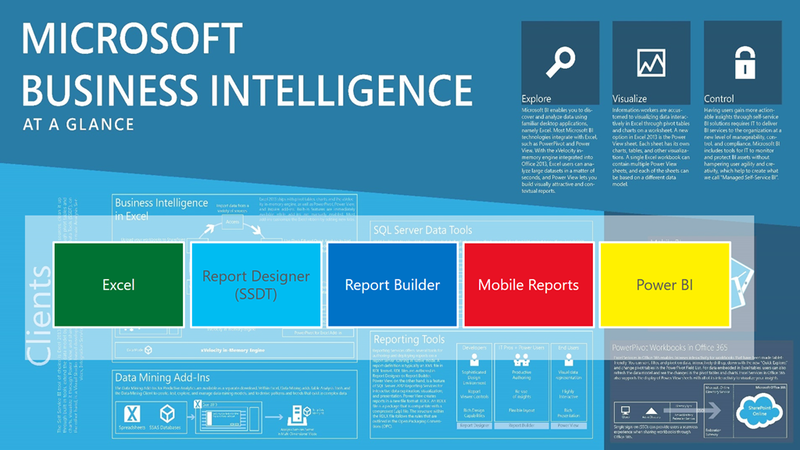 It is once again an exciting time to invest in the Microsoft analytics, reporting and BI tool set. Comparing the progress of new features added to SSRS over the release cycles, the product really slept from 2010 until 2016. Microsoft’s reporting & analytic platform has shifted significant as they moved from products to services, and from servers to the cloud. The dust is settling on this major refocusing effort. Capabilities that were introduced in Azure, Cortana Analytics and Power BI are now becoming available to “the box”, on-premises or in hybrid cloud scenarios. We can expect more announcements on this as the roadmap is played-out and gaps are filled-in. Reporting Services is a central player in the on-prem delivery of the BI, analytics and reporting tools offered by Microsoft. These include Excel, Paginated reports created with SSDT/report designer or Report Builder, Mobile Reports and Power BI Desktop. This entry was posted in Power BI, Self-service BI, SQL Server, SQL Server Pro Magazine, SSRS Design. Bookmark the permalink. Paul, I’m very glad with new capabilities from the SSRS, but, I have a lot of clients using SSRS integrated with Sharepoint, and I just have heard from native solution. Are there expectation to replicate the news to integrated mode too?